I have arrived at our departure hotel, the Cataract Pyramids Resort. Last night I met up with many of the riders. Still not learning everyones names (keep asking a few times), but nice to meet up. As it has been described, “not just a ride, but also a social experiment”, part of the fun is traveling with many others who have all come together for this adventure. The song says, “It never rains in Southern California”. However, the impression is it also doesn’t rain much in Cairo. We had just some occasional rain overnight as well as slight rain shower during the morning. Rain itself isn’t much, but it seems to make the formerly dusty roads a muddy mess. This morning I brought down my bike and rode for a brief 1km along the road before deciding against getting myself completely splattered to start…at least wait until day #1. 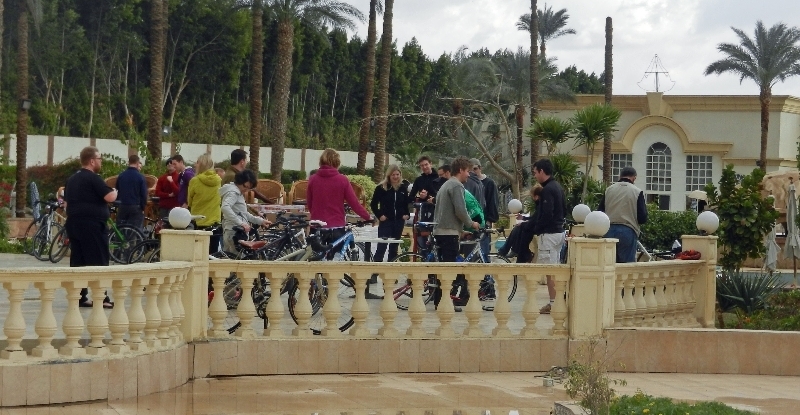 Otherwise as first photo above shows, riders have been busy assembling and testing out their bikes. In the afternoon we had our the first official rider meeting, mostly working through so everyone understood how logistics work as well as expectations for the trip.